Facebook is a very strong medium to advertise your product and gain maximum exposure. It can help businesses build up ever lasting relationships with their customers. 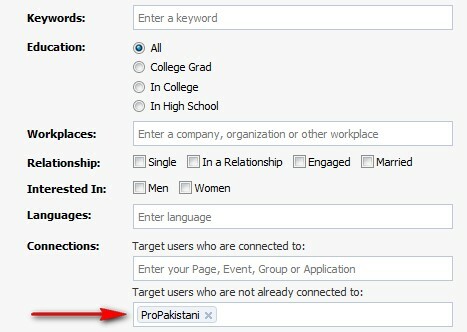 These days, many companies in Pakistan are trying to seek benefit from Facebook. Unfortunately – most of them end up in loss. Running a social media campaign is very different than traditional marketing campaign. I will outline some tips which will really help to maximize return and minimize loss. Those companies who think that starting a advert campaign on facebook with an ad copy and a constant cash flow can help them achieve their targets are basically stupid people. Don’t even think about directly selling your product to your target market. Facebook is very different than Adwords. People are not opting to buy your products rather you are pushing to them – so in simple terms, it won’t work. You may become lucky and get some direct sales. But in reality, the broader market will not buy your product. Rather than selling your product or sending your customer to some sale page, make a fan page and send them to it. Facebook fan pages are like a reminder for your customers to buy your product. In theory, when you make a fan page and start communicating with your customers – they will become your advocates. They will listen to you and then, later on you can send them your deals periodically and maximum will result in sales. Facebook gives you option to target people on multiple basis. Target people smartly, the more narrow targeting the better. Otherwise you will just get clicks and your daily budget will get wasted. Create an Ad copy with relation to your targeting. For example, if you are targeting people on the basis of their birthdays and you are selling an ipod then mention something like ‘best birthday gift imaginable’. Meaning, Ad copy should be what people want to see. Capitalize words because they always have a higher CTR. You straight forward, easily readable text. Your title should speak to your customer. Don’t think that you are the only one doing facebook advertising. Try to view the market, see what other advertisers are doing, what ad copies they are creating, see what people are liking – in short understand your market. If you end up getting tons of clicks and no results then don’t panic. Test for two three days and then compare the stats. Try to stand out from the crowd. Keep an eye on your campaign stats. Spend some time and analyze them. Study each and every aspect. See what is your CTR, bids and everything.Visit facebook ad reports area, there facebook lets you download three kinds of reports. Download them and study them, try to fill the gaps. If you find a good Ad copy which is showing good results for you then don’t just stick with it. Create new Ad copies and run them periodically. Test and see which one is showing the best results. Select it and discard the rest ad copies. Remember! the basic key is testing, testing and testing. 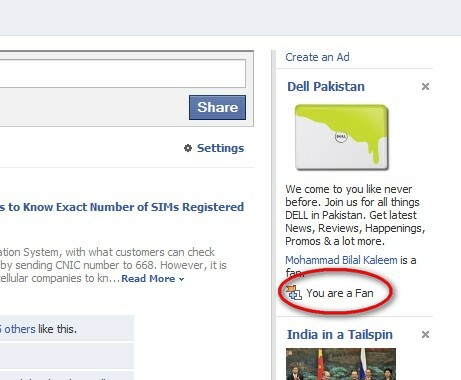 In this example Dell Pakistan is even targeting its already fans. This annoys your fan a lot and also you are wasting your money. If the customer clicks your Ad you loose money and gain nothing. Filter your already fans. When you are making an Ad and targeting people, facebook lets you select connections. There is an option ‘target users who are not already connected to’. In it put your facebook page so your already fans don’t see your Ad again. Take a look at the below screenshot for a better understanding. Try to implement these tips and share with us if you observe any difference in your campaign. If you knew these these tips then that’s good. Also share some additional tips with us in the comments. I will try to come up with another post full of some new tips – this is all for now. i didnt understand last step…do u mean that if i have a page for example abc so in last filled i put abc to avoid abc fans??? jazak allah khair for this article. yes – don’t waste money for displaying ads to your fans – filter them out, and target those who are not…! Nice information. It will help me a lot. Thanks for sharing this unique Article. But when i go to more ads there your ad is also coming written you are a fan. is it any way to hide ad in all ads for those who are already fans. Yes you are right. It does show in the more section. But that is for the convenience of the users, it then shows them all the best performing ads in here. But you don’t have to worry about this. No one actually clicks more ads. Your ad will remain hidden from the usual advertising section on the right sidebar. okz… yup the fact is that majority don’t click on more ads.. There are couple of very nice points, specially the first one. People need to understand the importance of brand recognition, provide a platform to your users where they can share their experience and interact with management at some level, instead of slapping them with your ads. Its better to adapt the approach discussed in first point, as that might eventually lead your fan to buy your product. Zeeshan i like your article about the trying different ad copies and all, but don’t you think we need a certain brand recall for those users who are fans but dont no whats up with the fan page i think if an ad appears to those who already are fans of that particular page is actually good for your brand or your product because it brings in a recall of the campaign. An yeah probably your argument may be right but that’s how i see it, then again social media is about conversations not promotions. i hav problem with creating ad. as i put my Cr card number it says ‘unable to process your order at this time.